There are no records for the dates between 1897 and 1905. Outgoing correspondence from the office of the Government Agent, Revelstoke, B.C. (letterbook copies), 1896-1897, 1906-1916. 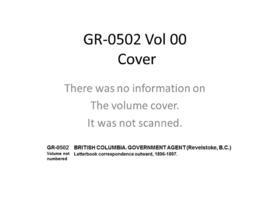 Transferred from the Government Agency, Revelstoke by D.G.B. Roberts, Government Agent.